I was chugging down Via Caracciolo the other day on my four 14-year-old cylinders. The 18th-century Royal Gardens —now a public park— were on my left, and coming up on the right was the Castel dell'Ovo, built on the site of the original Greek settlement of Naples, later also the site of the last prison of the last emperor of Rome. I was sort of enjoying the 'history' of it all, when I noticed a gigantic tour bus in the rear-view mirror, about ready to blast by me. They were in a hurry —definitely not on a Grand Tour. If you define 'grand' as 'extravagant' or 'leisurely' or 'relaxing', then whatever else traveling is these days —fast, convenient, cheap— one thing it is not is 'grand'. I say this in spite of being totally seduced by the idea of sub-orbiting from Europe to Japan in two-and-a-half hours aboard a hypersonic ram-jet spaceplane. But it will still take me forever to fight my way through traffic from my house to the hypersonic ram-jet airport, and once aboard, I will be force-fed hypersonic ram-jet spaceplane food, and at my destination be corralled into a holding pen waiting for one surly bureaucrat to rummage through my underwear while another compares my passport photo to Interpol mugshots. Good, you get there, but 'grand' it ain't. 'Grand', as in the Grand Tour, means going back to the eighteenth and early nineteenth century and taking a few months off to travel around Europe and complete your education on lots of daddy's money. You traveled by ship, train (from the early 1800's onward) and horse-drawn barouche or dormeuse. You didn't wear bowling-shirt and tennis shoes, either. You packed burnouses, cloaks, frocks, spencers, waistcoats and a nice selection of cravats and collars; after all, you would be dressing for dinner, a leisurely affair with educated conversation before, during and after, enlivened, of course, by your own sparkling wit. Now you were off to do some cultural empire building of your own: around the Continent —Paris, Vienna and then the grand finale of the Grand Tour, south to Italy—across the Alps and down into sun, music, art, romance, hurtling back to the dark intrigues of Renaissance Italy, then back further to the glories of Imperial Rome, to the beginnings of Christianity and then the ancient Greek outposts of the southern peninsula. For well over a century, young northern gentlemen swarmed through Italy so they could get what a thousand books could not give them, so they could personally explore millennia of history upon which their civilization was built, so they could tread where Michelangelo, Dante, Augustus, Virgil, Peter, and even Ulysses had trod. 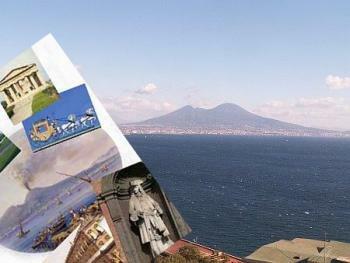 Byron, Shelly, Goethe, Mozart, Stendahl… and on and on—they all came to Italy, and most of them came to Naples, the southernmost point on the standard Grand Tour. In the 18th century, visitors to Naples found a city rebuilt by Charles III of Bourbon: royal palaces, broad streets, the finest opera house in the world, a city entirely to suit the opulent tastes of the monarch and then of his Hapsburg daughter-in-law who would run the kingdom (while her milksop husband 'ruled') until well into the19th century. I can't begin to tell you of the glory of a night by full moon when we strolled through the streets and squares to the endless promenade of the Chiaia, and then walked up and down the seashore. I was quite overwhelmed by a feeling of infinite space. To be able to dream like this is certainly worth the trouble it took to get here. Perhaps he begrudged the natives their easygoing approach to life more than a little when he observed that in Naples "…as long as the queen is pregnant and the king is off hunting, all is right with the world." Thrill through those roofless halls. The listening soul in my suspended blood. So, as the bus went by me I frantically signaled to the tourists trapped within. I made what I was sure were universal gestures for "18th century royal gardens" and "…the last prison of the last emperor of Rome". Stop, I said, beckoning them to tarry a while and partake of genteel discourse —in short, to 'get grand'. It was too late. They were gone, on their way back to the airport.